I had the good fortune to finally enjoy the Singapore Airlines Suites Book The Cook Kyo Kaiseki after missing out on that in 2013. 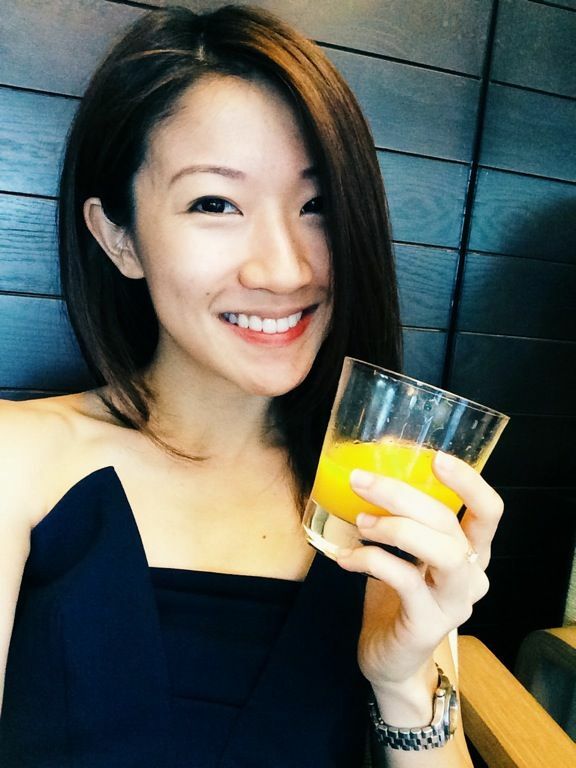 2014 was the year to make it happen and that also allowed me to do a more detailed review of the most premium offering by Singapore Airlines. YAY. Took a day flight this time and that made photography a lot easier and better. :) Here is a better look at the Suites cabin. I noticed that the cabin looked a little dated and worn around the edges, something that i didn't notice previously. Well the leather seats are still very comfy though. Individual cabins with sliding doors and window blinds. Close the door, draw the blinds, or leave everything open. It's really up to you. Since we took a day flight, there wasn't the opportunity to roll around in the flat bed. Obviously we could if we wanted to but that would be lame. 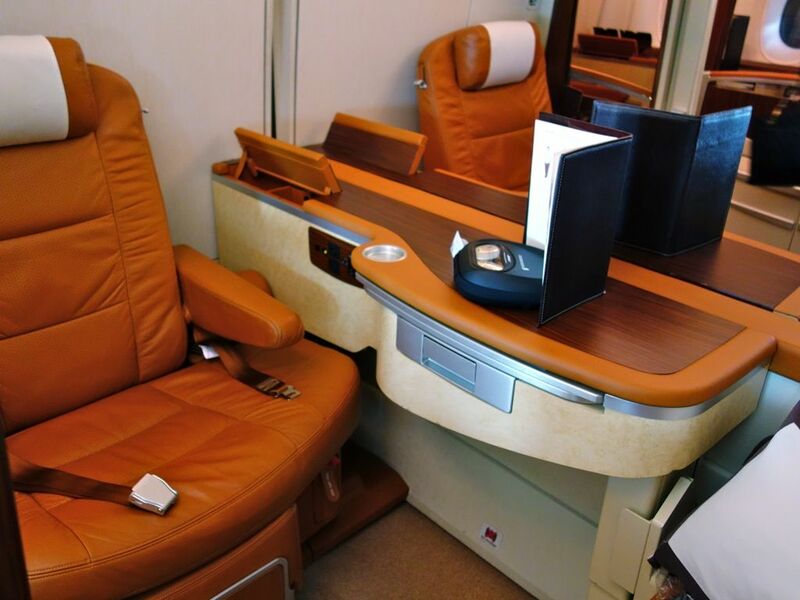 Well you could check out my other Singapore Airlines Suites review here. Like i mentioned previously in my SQ A380 Business Class review, the J class flat bed is really sufficient for a long haul flight. 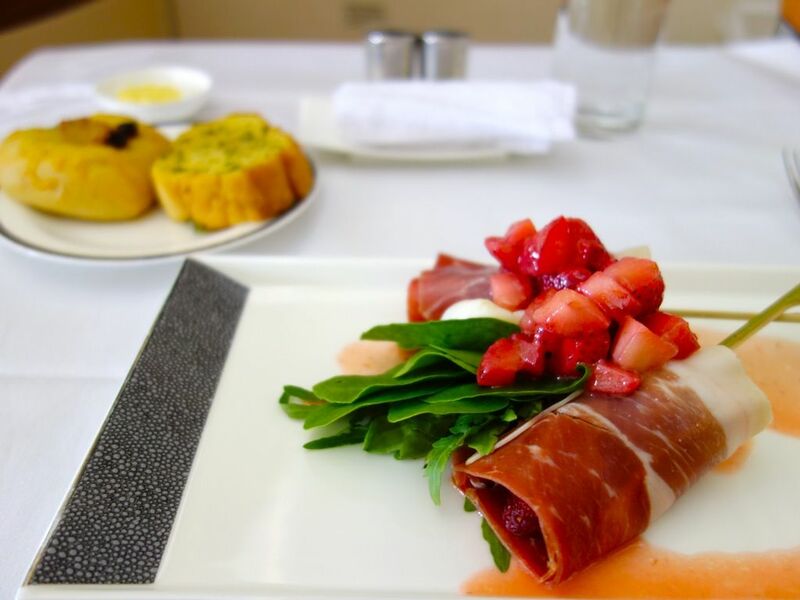 Suites is not exactly required unless you can't live without your caviar. Another part of Suites that i love is not having to deal with overhead storage. So the rimowa goes nicely under the seat in front and the Balenciaga remained there till takeoff. The bag was carefully placed into a SQ dustbag by the stewardess, and placed together with the luggage when we took off. The additional seat has another purpose, which i'll share in a bit. Oh and for those who need to work on the flight, USB and power points are available for any electronic devices, and BOSE noise cancelling headphones if you need some peace and quiet. 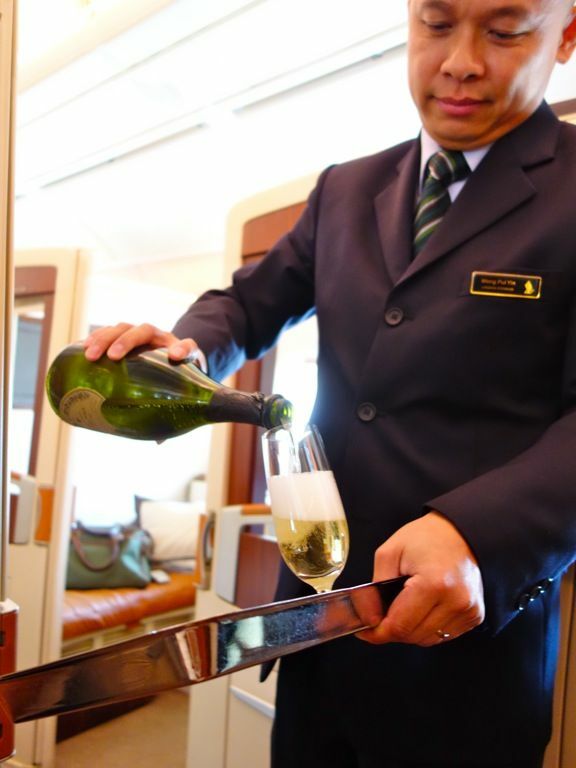 Of course pre-flight bubblies are a must and they serve the Dom Perignon Vintage 2004 on board. Well i guess they kept the better champagne for the flight as The Private Room lounge did not have them. The pale gold liquid gave away aromas of almond and powdered cocoa. Fresh citrus with hints of dried flowers followed next, before finishing on a sappy, spicy note. My other favorite champagne, the Krug Grande Cuvee was also offered but that's available at the lounge as well. Wine drinkers could get their selection of French and Italian. On to the food. 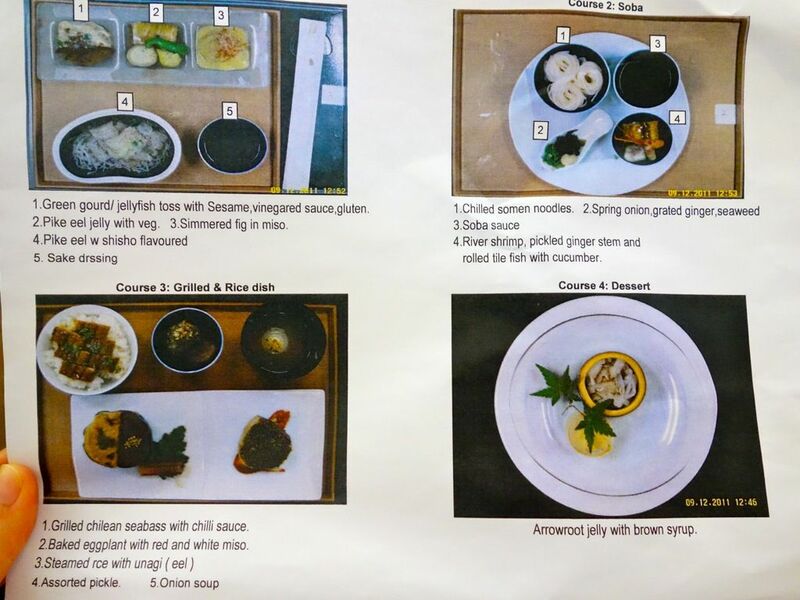 Here is my Kyo-Kaiseki designed by Singapore Airlines International Culinary Panel Chef Yoshihiro Murata. Course 1: Green gourd/jellyfish tossed with sesame, vinegared sauce and gluten puffs. 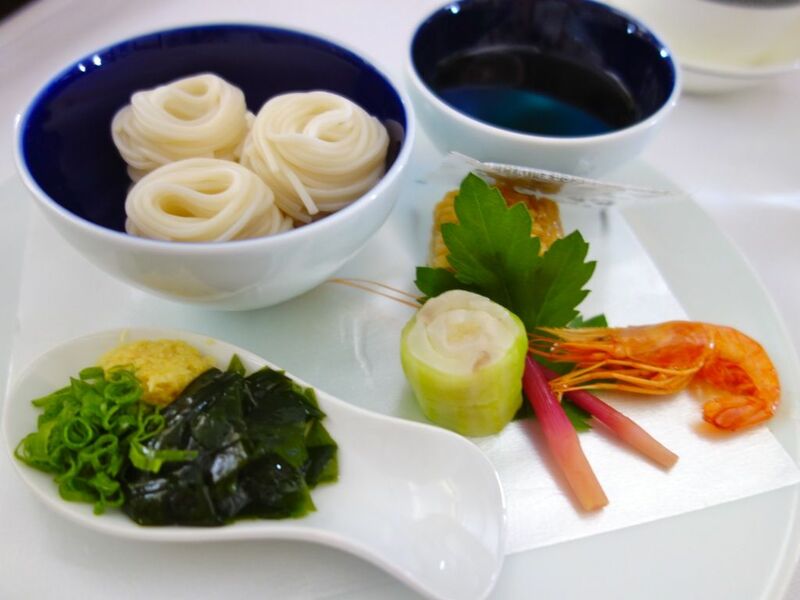 Pike eel jelly with vegetables. 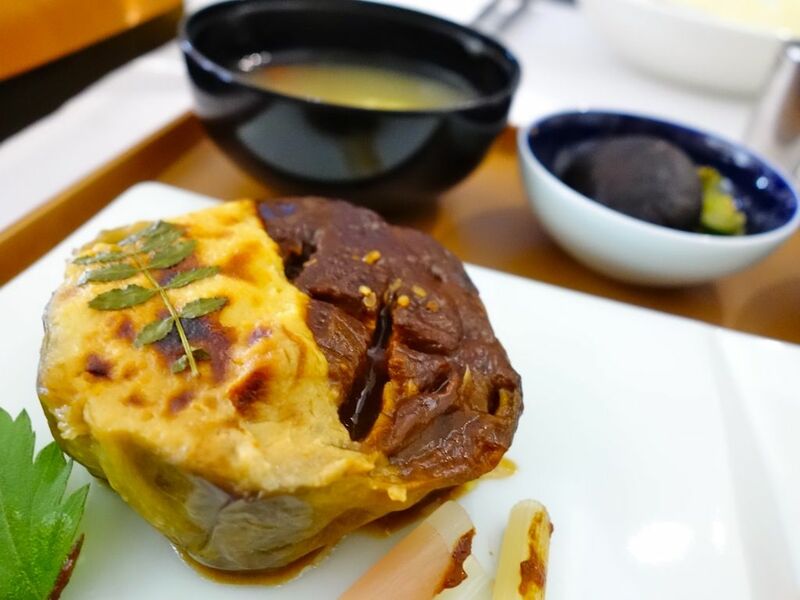 Simmered fig in miso. Pike eel in shisho sauce. Truth be told, i was disappointed with the first course and was worried about the rest of the meal. Pike eel is not a favorite of mine. I found the texture too jellyish and bland but that's me. The miso fig was the only thing i enjoyed. Course 2: Chilled somen in dipping sauce with a side of river shrimp, pickled ginger and rolled tile fish with cucumber. I enjoyed the texture of that somen and it must certainly be freshly prepared on board as the noodles did not stick to each other. Course 3: Grilled and Rice dish. Finally something more enjoyable. 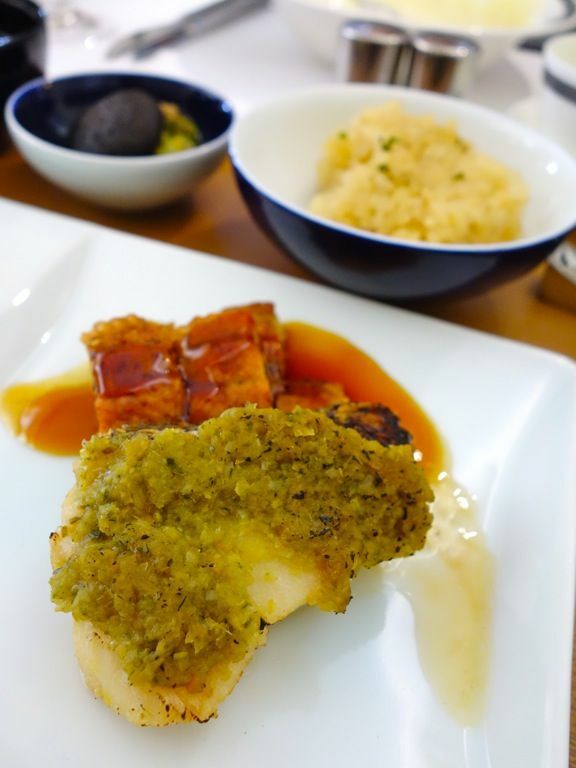 The course consists of a grilled Chilean sea bass which was a little bland and dry. The unagi made up for it though and the Japanese fried rice was surprisingly tasty. No overly fried and dry grains in this one. I wouldn't expect less of Suites. My favorite part was the baked eggplant with red and white miso. This was absolutely amazing. I may be biased because i'm a huge fan of miso, though not so much of eggplant. Well, this dish changed my mind on the purple vegetable and i've tried recreating this dish at home. Well, because i kept asking the steward and stewardess what they were serving me, they politely shared with me the menu. Well well, one can get away with anything if you ask politely. :) Everything had to be plated according to the visuals btw and the staff did quite a good job i must say. 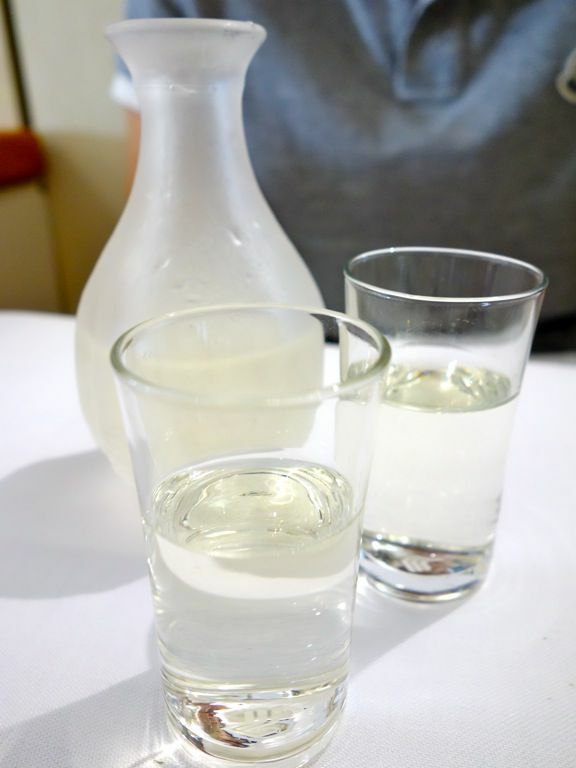 Of course, sake to go with my Japanese meal. Well, i didn't quite enjoy my Kaiseki but perhaps that's because i've set really high expectations of the meal. The flavors are on the bland side in my opinion. It's not really gonna stop me from ordering another kaiseki meal on board because i've had many others that were quite decent. And since this is based on a seasonal offering, i can expect to taste a different menu next time. 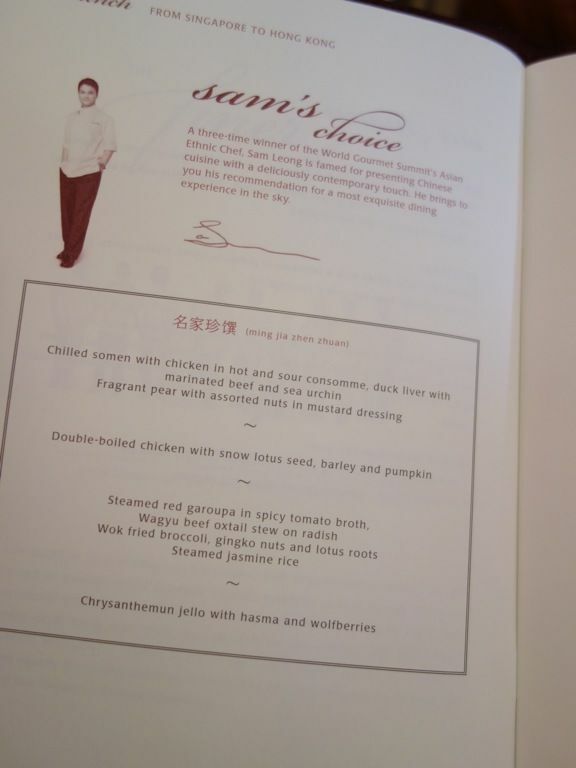 As we didn't want to leave our meals to fate, S also chose from the Singapore Airlines Book the Cook selection, which was a pity because Chef Sam Leong's choice looked super yummy! Darn. 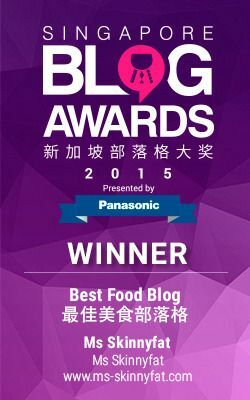 Would love to try his Cantonese food. BOO. Here's S's appetizer of rock melon with prosciutto. 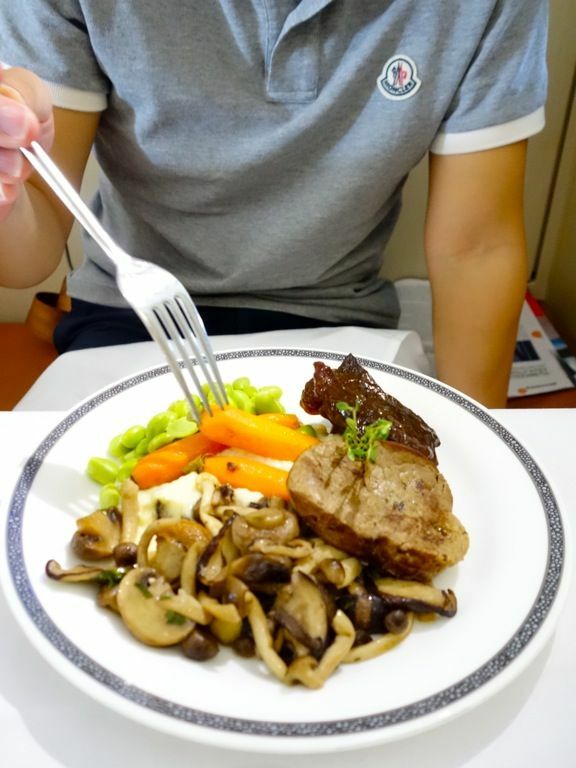 For mains, he had the Pan-Fried Veal Loin and Braised Veal Cheek, with parsnip purée, fresh garden vegetables and mushroom ragout. That braised veal cheek was fork tender and really tasty while the veal loin was a little dry. 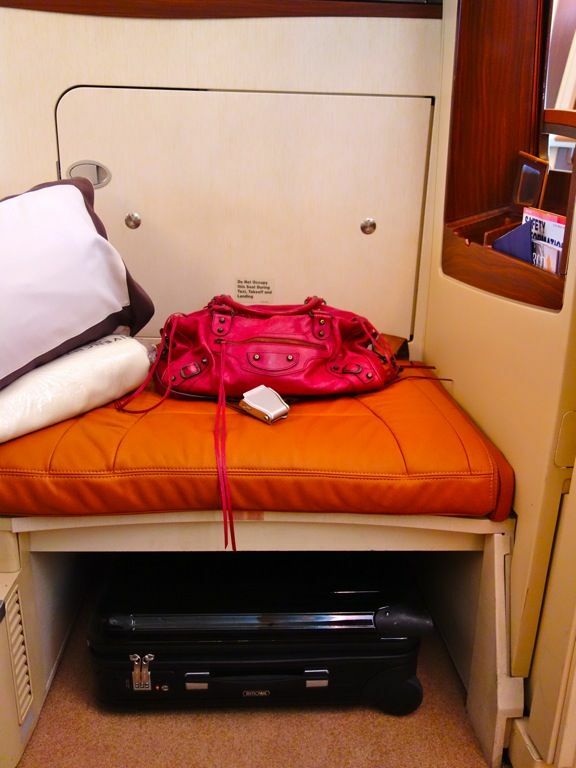 Oh if you're wondering about the extra seat, it allows your partner to dine with you in your cabin space! We tried it and it was rather comfortable for 2. Table space was tight but it was rather well managed. Now back to desserts. 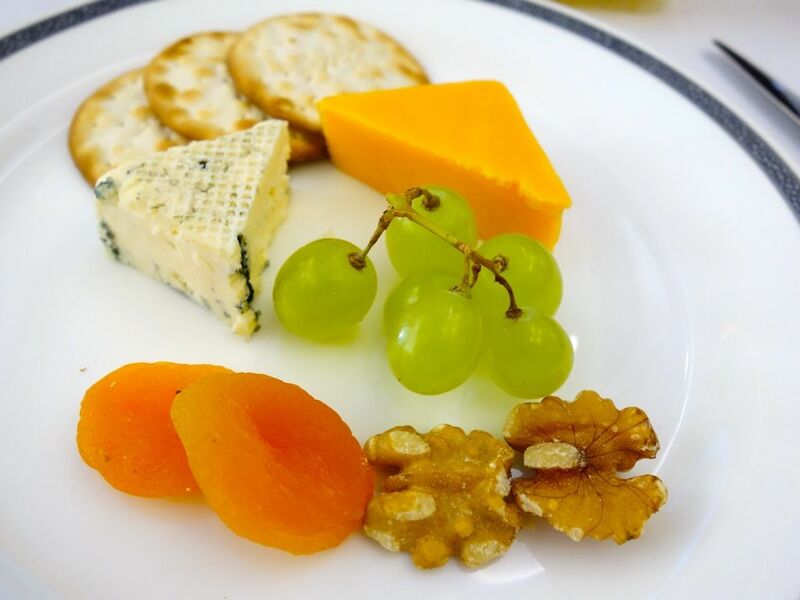 The steward and stewardess noted that i've an interest in food and so they made us a platter of all the desserts available on board! How sweet of them. This is the Arrowroot jelly with brown syrup from my Kaiseki course. Another light tasting dish. 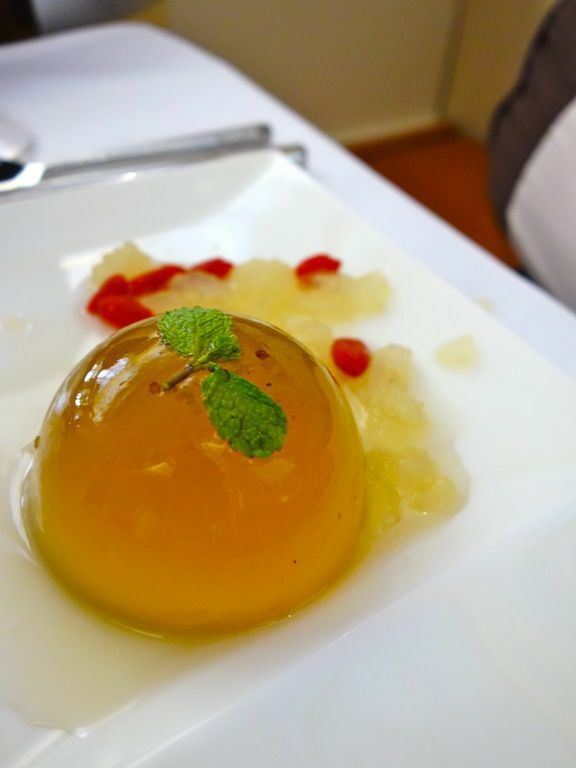 We also sampled the Chrysanthemum jello with hasma and wolfberries from Chef Sam Leong's selection. Loved this one! Absolutely refreshing and full of goodness. 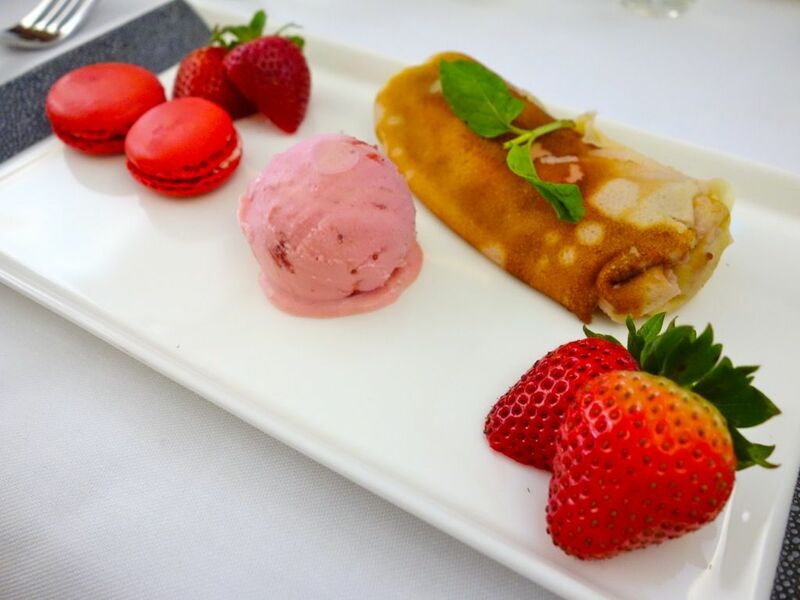 The warm strawberry crepe with strawberry macaron and strawberry ice cream, part of the regular meal. The ice cream was good, probably Haagen Dazs. The crepe was kinda soggy though. 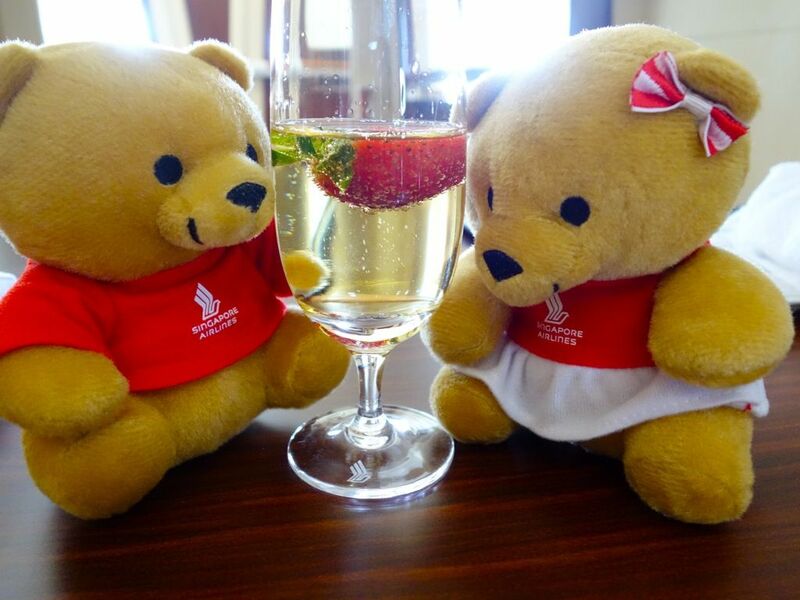 Because i've been such a good girl, we received a pair of Singapore Airlines bears! These are special ones created for National Day. Last but not the least, we ended it with a selection of Canzona Danish Blue, Scamorza Affumicata and Red Cheddar cheeses. Looks like you flew the old suites. The new ones have a much nicer trim on the seats. The last time I flew R to MEL, the sliding door had problems closing and it took quite a bit of strength to open/close them. Bummer really. Hoping my upcoming flight to NRT will fare better. 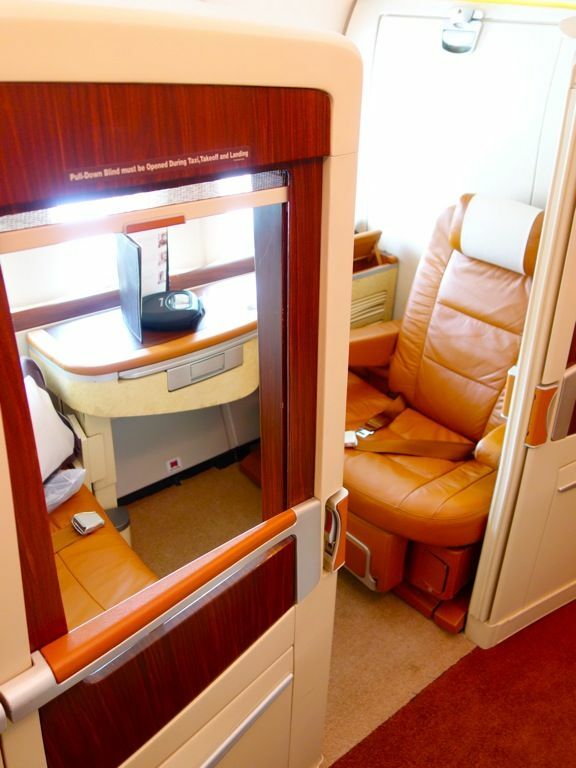 If possible, I would recommend flying Etihad's Residence. Only problem is the A380s only fly out of AUH to SYD, JFK and LHR at the moment.